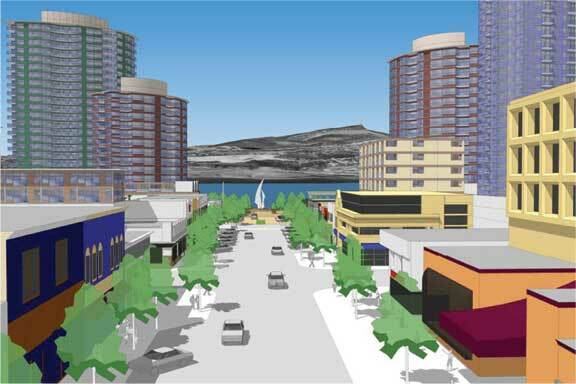 Artistic rendition of what the view down Bernard Avenue might look like. I’m a bit of a geek so I went to this morning’s city council meeting to find out what’s going on with the CD-21 zone. It turned out I was one of about 10 interested members of the public, in addition to the three paid reporters who were there. This has a lot of people’s attention. There wasn’t much to the meeting itself. Councillors finally got a chance to blow off some steam on an issue they’ve had to keep bottled up for the last 15 months, got to grandstand a little and got to stake out their rhetorical territory. The only member of council to not speak on the CD-21 zone at all was Coun. Graeme James, a man of few words at the best of times who has already made clear he doesn’t think this reopening of the bylaws should be happening at all. As is his wont, Coun. Charlie Hodge spoke the most. He will clearly be questioning every aspect of this plan. The most interesting tidbit came from Mayor Sharon Shepherd. She said part of her frustration with how the original plan came together in October 2008 is that they went through the public hearing, heard from dozens of residents who had all manner of suggestions but then council really wasn’t in a position to made amendments to the plan based on those suggestions. The plan basically had to be approved or defeated as is. She added that she wants to find a way to avoid the same pitfalls this time around. “We could end up in that place again,” she said. It seems to me that it’s crucial there be a procedure where the concerns raised in a public hearing can be addressed in the final plan. What’s the point of having a hearing otherwise? The other interesting thing was the demeanour of city staff. Having already spent hundreds, possibly thousands of hours working on this project while spending thousands of tax dollars on consultants in drafting the plan, they seem to want this review process to happen as quickly as possible and to result in only minor changes. Hard to blame them, though democracy is often slow and messy which isn’t necessarily a bad thing. And I may be imagining things but when I looked over at the staff, I thought I saw a look of fear in more than one set of eyes, a fear that a beast they thought was dead and buried is coming back to torment them anew. To the staff’s credit though, they are providing council with everything it asks for. The proposal staff brought to council was to hold one three hour workshop on March 29. In that time, they proposed to provide council with an overview of the CD-21 zone, answer their questions and then get a list of proposed amendments to go off and work on. But right off the top, Hodge suggested that at the very least, two three-hour workshops would be needed, one for the overview and one to deal with council’s areas of concerns. “I’m not satisfied we’re going to have enough time to answer all of council’s concerns,” he said of the proposed timeline. Hodge was quickly backed up by other councillors and so now there will be two workshops, one on March 29 and the other in late April. This saga is only just beginning. Good reporting. I really appreciate it.